Once again, wishing all the little school girls and boys a good morning! In honor of the first week of school in my neighborhood, three kindergarten pictures and a kosher version of “Good Morning Little Schoolgirl” by Smokey Hogg. Madeleine in pigtails, like her grandma used to wear, on her first day of kindergarten, two years ago! Lovely, really takes me back! Thank you for this! 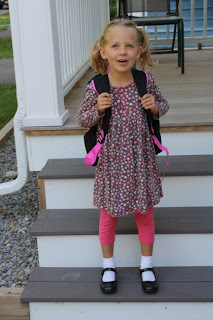 I just realized that this is the first year in 20 years that our house has not had a first day of school!! Swoon! is there anything as cute as little girls? And little girls with pigtails? Extra cute! Awwww…Risa, you were such a cutie!